Meets US Coast Guard specifications. The Larson Electronics HALP-EMG-24-3L-LED Hazardous Area LED Light Fixture is U.S./Canada UL Listed Class 1 Division 2 Groups A, B, C and D, UL 1598A listed, has a T4C temperature rating, and is specifically designed to handle the rigors of wet and corrosive marine environments. This fixture is equipped with an added battery backup providing 90 minutes of emergency runtime. 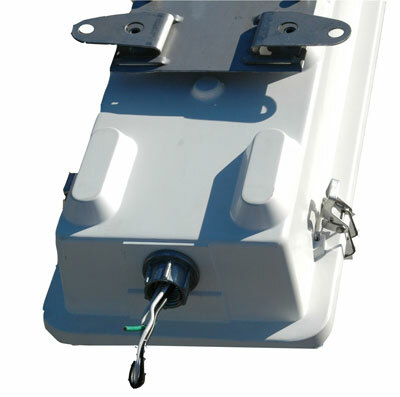 The HALP-EMG-24-3L-LED hazardous area fluorescent light fixture is designed for use in wet areas and saltwater-marine environments where corrosion resistance is critical to equipment longevity and safety. This Class 1 Division 2 rated fixture is constructed of non-corrosive materials including a polyester housing reinforced with glass fiber, a poured in gasket for reliable sealing and an impact resistant acrylic diffuser. Corrosion resistant stainless steel latches secure the lamp cover to the housing and provide a firm lock against the poured in seal to prevent drips and water intrusion. This fixture is UL 844 rated and Class 1 Division II, Groups A, B, C, D approved. The HALP-EMG-24-3L-LED also carries a UL 1598A outdoor marine rating and meets US Coast Guard specifications. This emergency LED light works, mounts and is wired like our HALP-24-2L-LED explosion proof LED light fixtures. The main difference is that we add a battery backup unit that adds emergency light functionality to the fixture. This hazardous area emergency light will run one bulb at the standard UL suggested 90 minutes after power is lost at 4116 lumens. The light recharges the battery once electrical power is restored. Standard configuration includes a single emergency battery backup that is automatically recharged and kept in a ready state. The battery backup unit includes a switched leg for turning the light fixture on/off without kicking the unit into emergency mode. We have eliminated the ballast normally associated with fluorescent fixtures which reduces overall weight, increases lamp life to an extreme 50,000 hours and helps this LED fixture maintain a T-4C temperature rating. The solid state design of the included LED lamps give this fixture superior resistance to damage from vibrations and extremes in temperature as well as a lamp service life over twice that of standard T8 bulbs. The 21 watt LED lamps produce more illumination than standard T8 bulbs, but draw only 3/4 of the current. The current generation of Larson Electronics LED T-series style bulbs produce 15% more light than standard T8 bulbs. This fixture has universal voltage and runs on 120-277 VAC and 9-32VDC for low voltage. Our HAL-EMG-24-2L-LED light fixture is both U.S. and Canada UL Listed. Standard Flange Mount Brackets: Flange type stainless steel mounts attached at each end of the fixture enables it to be simply secured to any surface. The mounts provide some shock absorbency protection while enabling the user to simply mount the fixture with the through-hole taps that protrude on each side of the fixture. The mounting holes are 36 9/16 inches on center apart along the top of this hazardous location light. The mounting holes are 7 inches on center across the top of the light. A sliding bracket mount is available so operators can retrofit this LED light fixture to use the pre-existing mounting holes from other fluorescent fixtures. Contact us for the sliding bracket option. Suggested Applications: The HALP-EMG-24-3L-LED is designed for marine wet and damp locations, where corrosion resistant fluorescent lights are required. This includes petrochemical facilities, lubrication pits, oil drilling rigs, crew quarters, solvent/cleaning areas, water treatment areas, processing plants and marine loading docks. 1. Each unit dielectrically tested. 2. Fixture arrives assembled and lamped to reduce installation time and cost. Flange type stainless steel mounts attached at each end of the fixture enables it to be simply secured to any surface. 3. 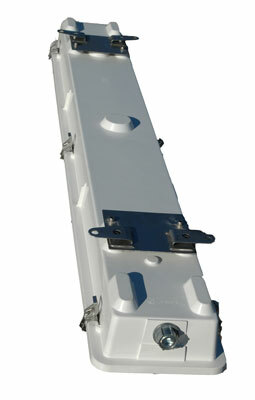 Fixture housing constructed of glass fiber reinforced polyester. 4. No ballast box. No ballast to replace. We simply run the black wire to one end of the bulb and white wire to the other. 5. Relamping done via 6 stainless steel snap locking latches which enables the operator to remove the door and access the lamps. 6. Lamp cover-diffuser constructed of high impact acrylic for corrosion resistance and lamp protection. 7. 1/2" or 3/4" threaded access hole for wiring conduit.